Nusa Penida is the largest of the three Nusa islands that are located southeast of Bali across the Badung Strait, at a distance of 20 km (45 minutes by boat) from Sanur Port. The other two Nusa islands are Nusa Ceningan and Nusa Lembongan. From an administrative point of view the Nusa islands belong to the Klungkung regency, which was the former center of the Gelgel Dynasty. the first written records of Nusa Penida have been found on the Belanjong Pillar. This pillar, located in South Sanur, dates from 914CE and shows inscriptions that tell us about the military expeditions of the early Balinese King Sri Dalem Wira Kesari Warmadewa, one of which was to Nusa Penida. Goa Karang Sari – at the east coast of Nusa Penida near Sampalan, about 4km north of Suana village, are some interesting limestone caves that are of religious and cultural importance. To reach the caves you have to do a short climb. You will need a local guide to bring you there, Do not forget to bring a flashlight. Puncak Mundi is with its 521 metres above sea level the highest point of Nusa Penida and offers great views over the island and over the ocean. A temple stands on the top of a hill. In this area you will also find alternative energy facilities with wind turbines and solar panels. Sebuluh Waterfall is located next to Cacah Village (part of Sebuluh), about 5 km from Batu Madeg village. Pura Batu Medahu and Pura Batu Kuning are interesting temples, at stunning locations on road along the east coast south of Suana. Continue on the minor road to the small village of Semaya and you will come to Pura Batu Madan first, after about 1.5 km and before you reach Semaya. Pura Dalem Peed – according to the Lontar Babad Dalem the Pura Dalem Peed was built in the 14th Century, at a time that the people of Nusa Penida revolted against the occupation of King Dalem Waturenggong of the Gelgel Dynasty. This temple is important to all Hindus of Bali. Many of them do an annual pilgramage to this temple to offer and pray for protection against illness and diseases. 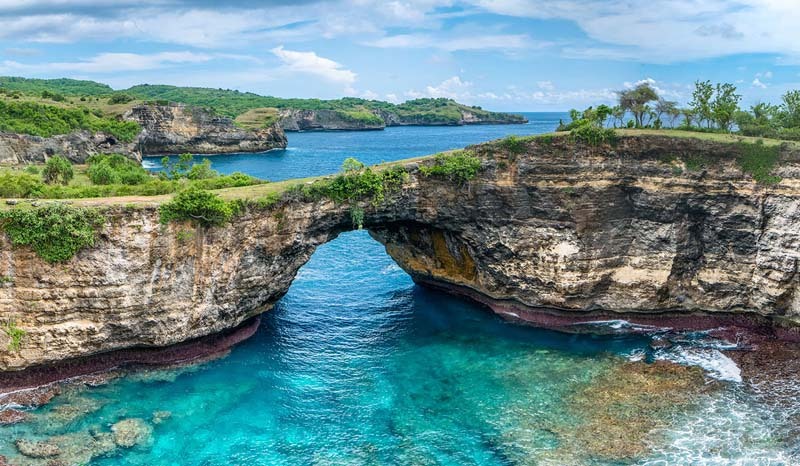 South coast cliffs – The remote and secluded south coast of Nusa Penida has high and spectacular white limestone cliffs with stunning panoramas over the ocean. The roads in this area however are very bad so be prepared when you intend to go there, but it will certainly be worth your efforts once you are there. There are many birds here which makes this area a paradise for birdwatchers. There are about 20 recognized divings sites around the island. Toyapekeh bay has beautiful coral pillars and a strech of reefs. Here you will see big schools of fish, sea turtles and occasionally mola-mola. Malibu Point has grey reefs with lots of sharks. The bay has strong up currents which is due to the swell coming in.